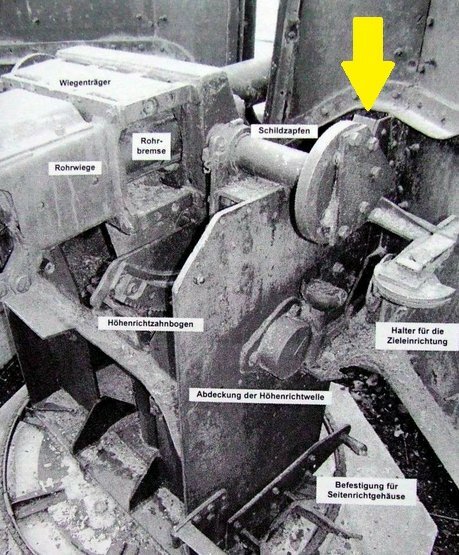 As the 5cm KwK 38 L/42 and 5cm KwK 39 L/60 guns were phased out of use on German PzKpfw III tanks, most were re-purposed as defensive guns on static mounts (5cm KwK Behelfssockellafette) for use in bunkers and field emplacements. Many found their way into bunkers along the Atlantic Wall and saw action during the D-Day invasion, proving to be very effective in their role as a multi-purpose coastal defense weapon. The gun comes as 15 resin pieces plus 6 ammo containers and 12 pieces of ammunition. The ammunition is evenly divided between complete and spent rounds. The shells are rather poor in my view. Ammo cases have 3 with closed tops and 3 with open tops with matching covers. 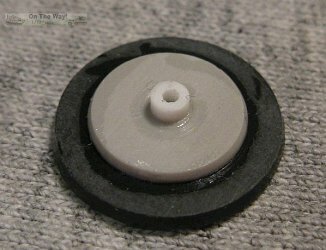 Resin casting is better than average. There is some thin flash and a few pin marks, neither being of much concern. The shield shows some very minor surface ripples. Instructions are very basic and come on a small sheet. The picture of the built model for guidance is totally inadequate. The pictures are small and grainy, and the lines pointing to parts location are vague to say the least. No decals are included, nor necessary. 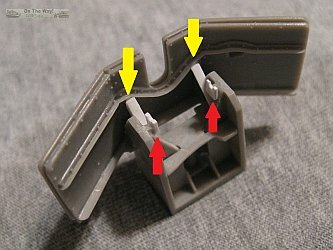 The kit has the gap for the spaced shield molded along the top and side edges. The bottom edge is where the pour plug is located, so if the modeller desires the spacing here it will have to be added. The kit's muzzle brake looks suspect (picture below left). 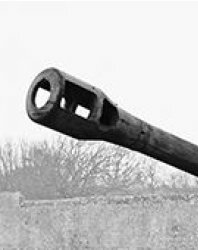 This gun used the 5cm L/60 barrel which should have a muzzle brake shown in the picture below right. The barrel looks a bit anemic, and in my set, is warped as well. It would probably be best to replace both the barrel and the muzzle brake with aftermarket items. 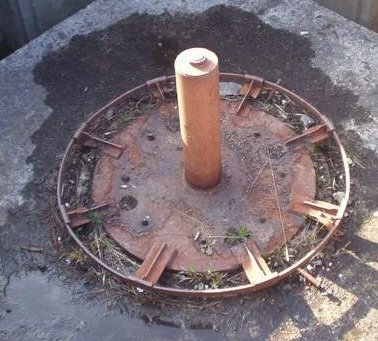 Another suspect part is the round turntable base (part 16). Compare the kit version with the picture below and you'll see that they don't look anything alike. Correcting this discrepancy will not be trivial. 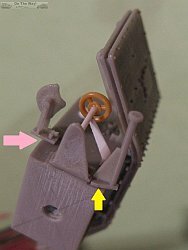 In the picture below left, you can see that the kit is missing the aiming wheels (red arrows) and the prominent disks at the the end of each of the trunnions (yellow arrow). 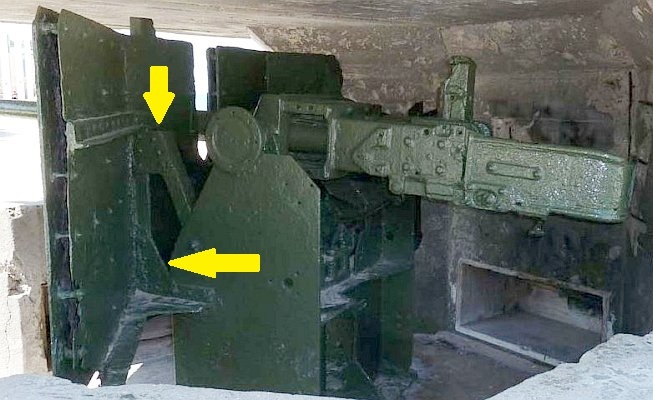 The traverse wheel is the one located in front of the gunner's seat and attaches to the gear housing (kit part 6) via a long shaft (not included in the kit) and has a brace (not included in the kit) that runs to the mount(green arrow). The elevation wheel is located on the side of the mount. 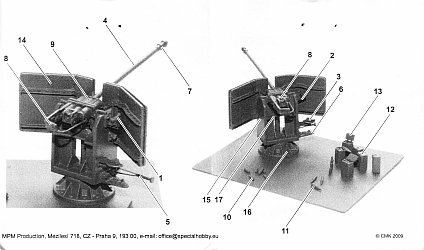 As can also be seen in the left picture, the right trunnion disk is what the sights attach to, and not to the side of the mount as per the instructions. A better view of how the sights mount to the disk is shown in the right picture (yellow arrow). 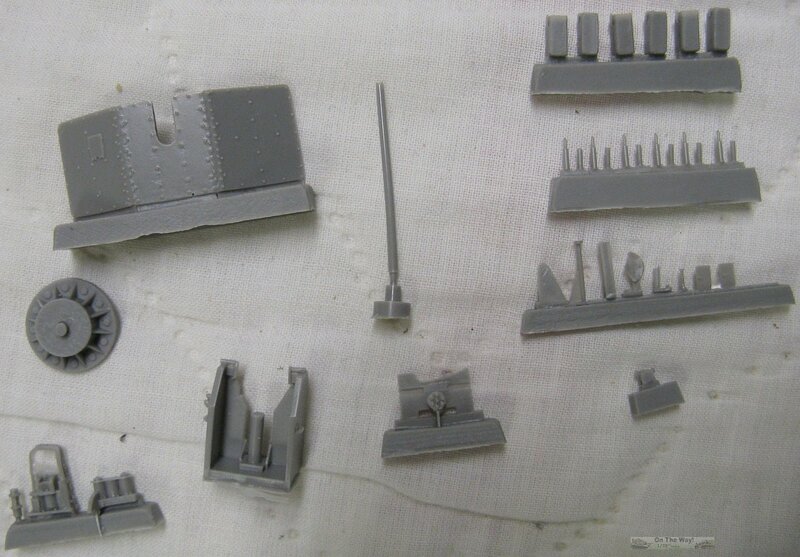 The vertical sides of the kit's mount are a bit on the thick side when compared with the picture above. Some period photographs show a spent shell collector bag that could be added if desired. 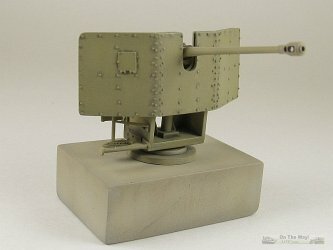 For those wishing to display ammo with their kit, the would be better served finding replacements for the poor kit pieces. 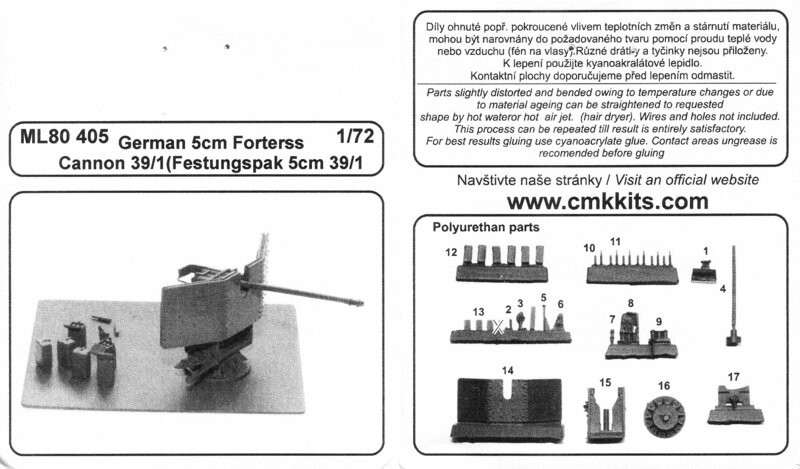 (22/August/2017 update): It appears that the kit is missing upper braces running from the shield to mount, though I can not be certain, as there is one un-identified part on the resin block beside part 2 that may be the brace in question. If so, I wonder why a second brace isn't on the block. 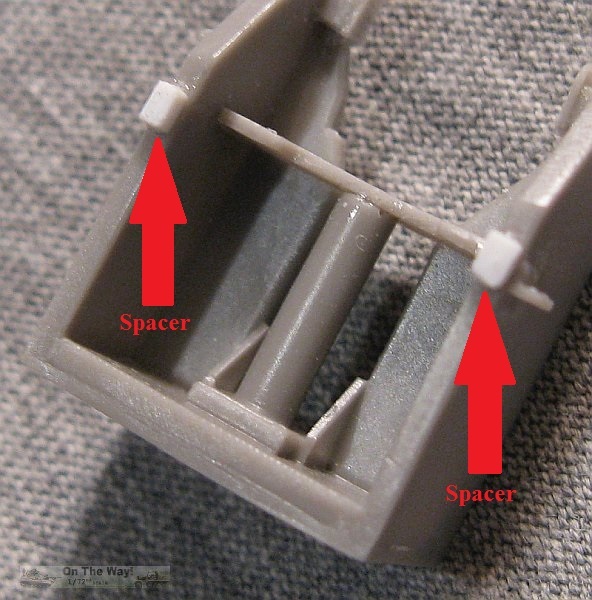 Anyway, the picture below shows what the brace looks like from the left side. I could not find a picture showing a right brace, so all I can assume is that it will be constructed as for the left side. Also note that the shield does not touch the mount anywhere, so be aware of this when attaching the kit's shield to the mount. A closer inspection of the ammo boxes shows that those with the open lids are in error regarding the number of rounds. The kit has 6 rounds inside versus the correct four per case. 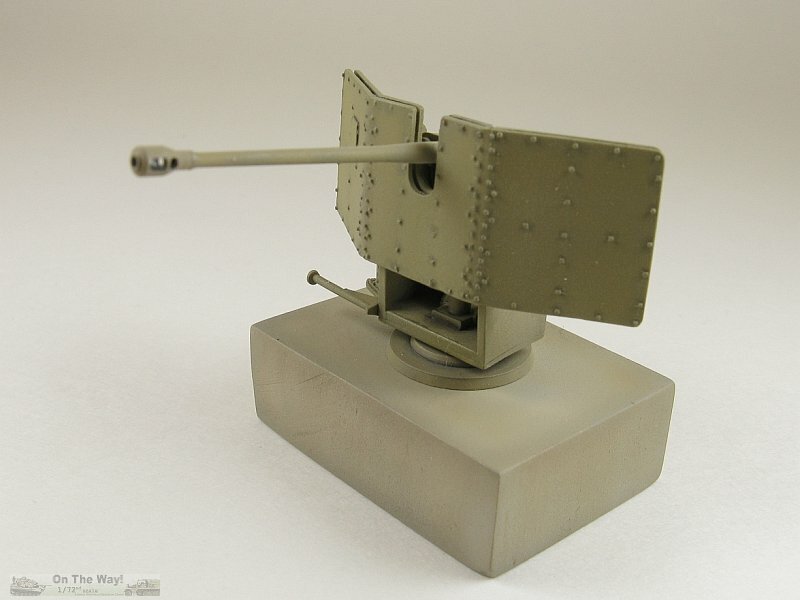 This same mount was used for the 5cm KwK 38 L/42 gun. 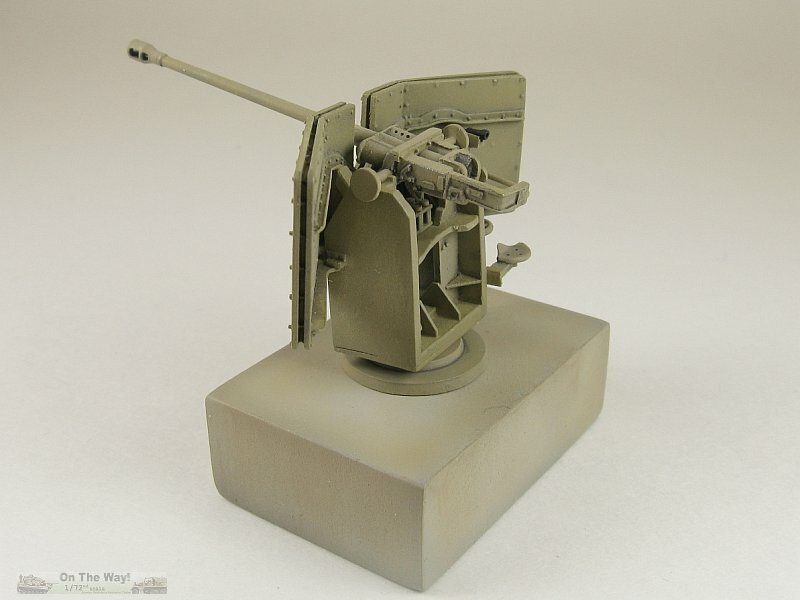 As far as I can tell the breech area is the same on both the KwK 38 & KwK 39 gun versions, so a swap of the kit's longer L/60 barrel for a shorter L/42 barrel would make for an easy conversion. Another interesting conversion, employing this same mount along with a French 75mm Mle 1897 gun as a make-shift anti-aircraft gun (as seen in reference 6), could be fashioned using this kit's mount joined with the gun from a donor kit, such as that offered by First to Fight. The widespread use of both the L/42 and L/60 gun in static positions along the west coast of Europe lends itself to numerous diorama possibilities. 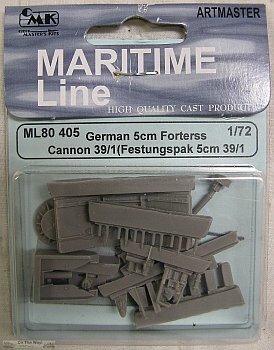 Particularly prevalent as part of the Atlantic Wall, they could be seen in open emplacements, or installed in ringstands, or in bunkers such as the R600 & R667 types. 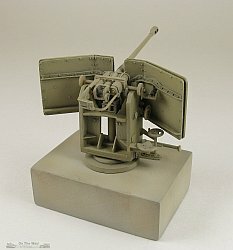 Many of these bunkers are available in 1/72 scale from manufacturers such as MGM and PN.Sud Modelisme. An unusual use of this gun has been found, where it was mounted on the bed of a Schneider CD tractor. Photos of this most likely one-off vehicle can be found in references  & . 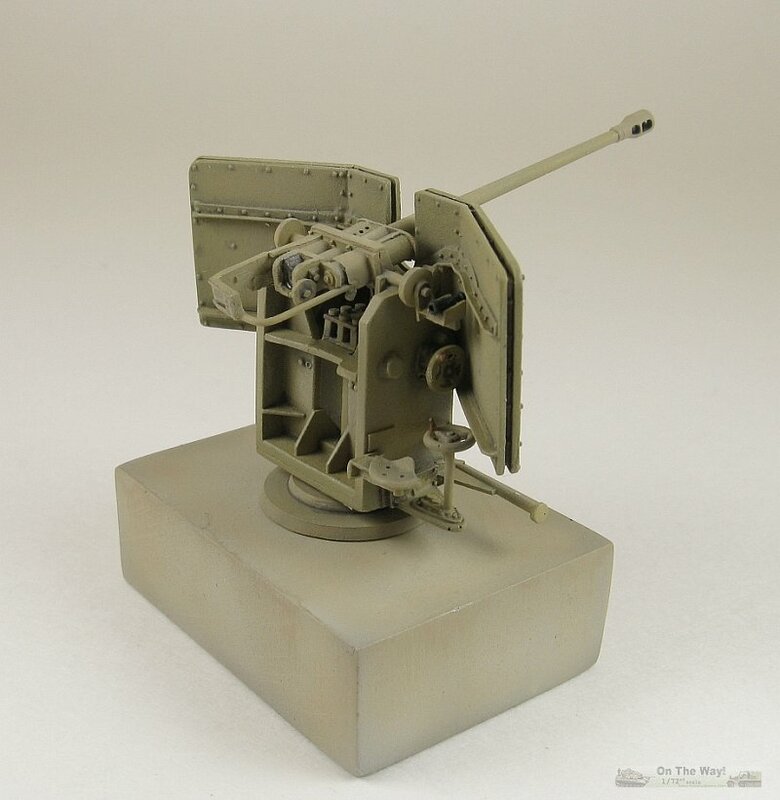 It's interesting to note that Chamberlain & Doyle of reference  have the gun identified as a 7.5cm PaK40. The armoured Schneider tractor could possibly be converted from MGM or Wespe examples. 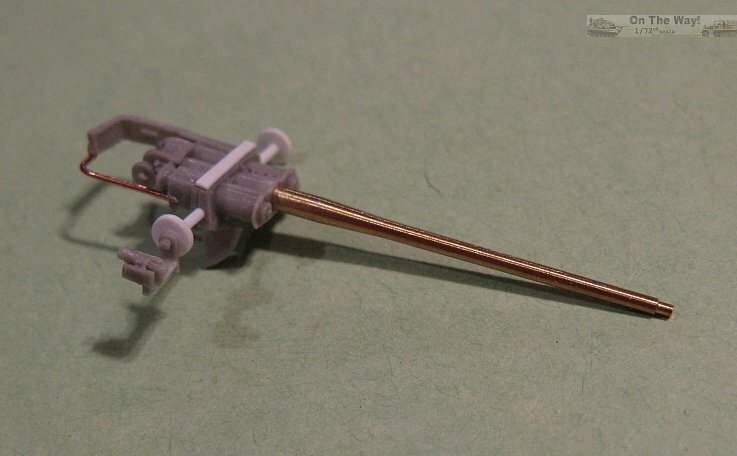 Overall this is an acceptable kit as far as resin kits are concerned. Casting is decent enough as is the detail. Only a few missing items and the probable requirement for a replacement barrel/muzzle brake detract from it's overall value. The first order of business was to address the poor trunnions and the mounting of the shield. My original preview and the following update on 22/August/2017 noted that the end of each trunnion was missing the prominent disk as well as the bracing between the mount and the shield. 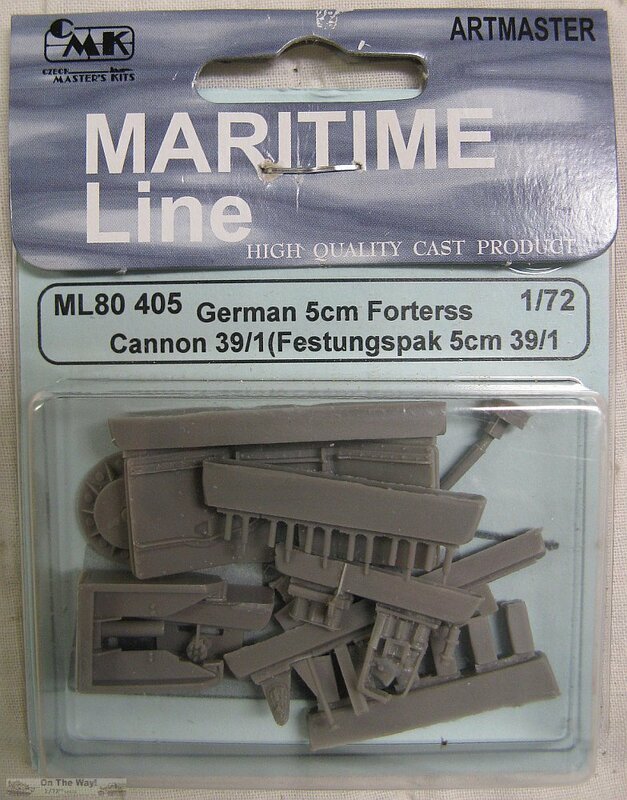 The trunnion issue I find particularly odd since the 1/87 scale kit of this gun, produced by CMK (which is the parent company of Maritime Line) has these disks. For the shield braces I started by adding a pair of spacers to the lower front part of the mount (red arrows in below left photo). The upper braces are sections of angle styrene rod (yellow arrows in below right photo). The red arrows in the photo below right point to the adjustments I needed to do to center the gun (described in the next paragraph). Then I started on the gun's modifications. After joining parts 8 & 9, a pair of holes were drilled in the sides. New trunnions were fashioned from short sections of round plastic rod which were then glued into the holes previous drilled. Both trunnions required adjustments for length. 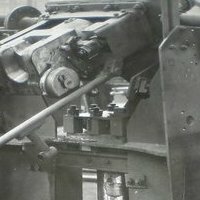 The left trunnion is slightly shorter than the one on the right side so a few cuts were done until both trunnions looked proper. It was here that I noticed that the barrel was not centered in the shield cutout. The resin trunnion mounts were removed and replaced with small pieces of styrene sheet that was marginally thicker than the kit's resin pieces. Then the right trunnion mount was thinned until I had the barrel centered to my liking. 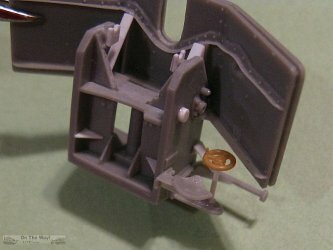 The disks were punched from some plastic sheet, added to the end of each trunnion and the sights glued to the right trunnion. The kit's barrel was replaced with a brass item from RB Model ( no. 72B48). This barrel is made for the 5cm Pak38 so it was too long. I placed it atop the portion of the barrel moulded to parts 8 & 9, marked it and cut off approximately 8mm from the breech end of the barrel. To get it to fit into the resin pieces, a hole was drilled and the cut end was bevelled to fit into the hole. The kit's poor resin brace that runs around the right side of the breech protector was replaced with a piece of copper wire. The final touch was a strip of plastic added across the top as seen in period pictures, which also conveniently covers the seam between parts 8 and 9. 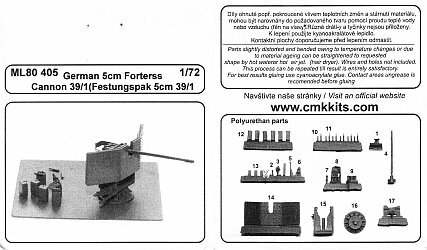 Part 17 is a shelf that runs between the uprights of the mount. 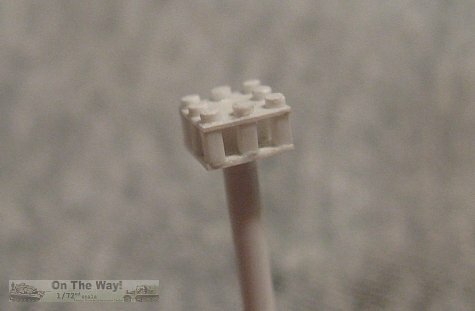 It also has the end cap of the spindle that extends up from the base. 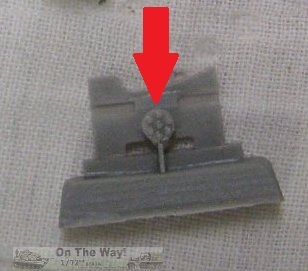 The kit represents this as a round piece (picture below right, red arrow) where it should actually be square (see the two reference pictures below middle). A new square cap was fashioned from plastic (picture below left). 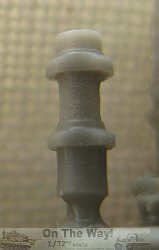 It is approximately 5mm per side and needs to be small enough to not interfere with the elevation gear located on the bottom of parts 8 & 9. 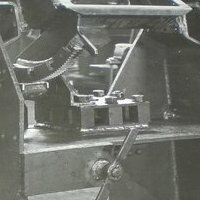 To the gunner's position the missing gun traverse wheel with its associated shaft and brace was added. On the right upright of the mount is a raised rectangle that the instructions would have you mount the seat on. This is incorrect. The seat should extend rearward from the mount (pink arrow in picture below right)and the rectangle should be removed. I didn't notice this error until it was too late to fix. 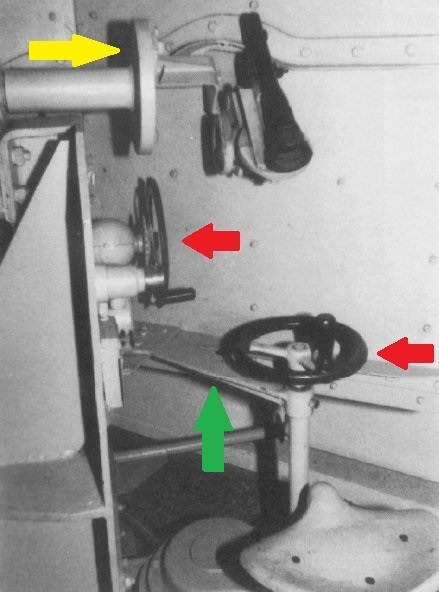 The gunner's footrest (part 5) should extend past the front of the upright (yellow arrow in picture below right). The kit's base is totally incorrect. Making one to match my reference pictures is beyond my abilities so I settled for a simple base. It's not correct either but in my humble opinion it looks more appropriate than the fantasy base that comes with the kit. 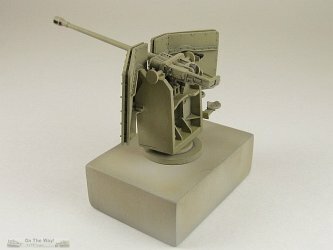 There is no painting guide for the modeller. 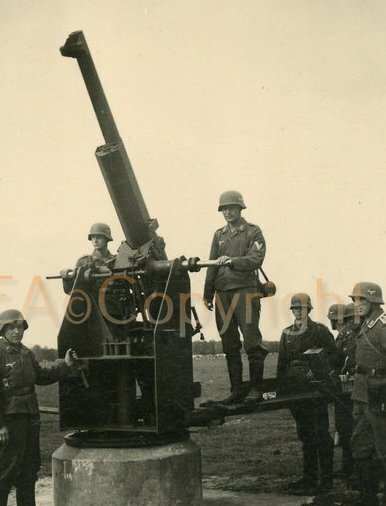 Period photos show everything from dark grey to panzer yellow, with many of the guns in the latter part of the war, circa D-Day and later also having green and/or brown added over the panzer yellow in most cases. This is a good starting point for making an acceptable display model. 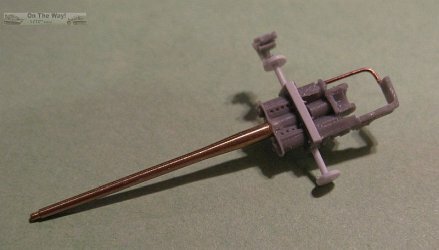 The missing aiming wheels and the poor gun barrel & muzzle brake force the modeller to go to the aftermarket or find alternatives in their parts box.